Adérito Alcaso holds a degree in Electrical and Computer Engineering from Instituto Superior Técnico - Technical University of Lisbon, a MSc in Automatic Systems and a PhD in Electrical Engineering both from University of Coimbra. 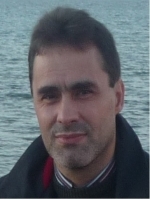 His main research interests are related to electronic power systems for renewable energies and electrical drives. Currently he is a Professor at the Polytechnic Institute of Guarda. Doctor of Philosophy , Electrical Energy Systems, University of Coimbra, Coimbra, Portugal, 2005. Master of Science, Systems and Automation, University of Coimbra, Coimbra, Portugal, 1995. Graduation In Electrical and Computer Engineering, Energy and Electronics, University of Lisbon, Lisbon, Portugal, 1990. Tessarolo, A.; Alcaso, A. N.: ''High-Power Synchronous Machine Drives''; Diagnosis and Fault Tolerance of Electrical Machines, Power Electronics and Drives, A. J. M. Cardoso (Editor), , 121-194 pp., IET - The Institution of Engineering and Technology (978-1-78561-531-3), London, UK, 2018. Loureiro, J.; Alcaso, A. N.; Pitarma, R. A.: ''Designing and Developing an Hybrid System for Electric Power Generation''; International Conference on Mechanics and Material in Design, Albufeira, Portugal, pp. 2, June, 2017. Loureiro, J.; Alcaso, A. N.; Pitarma, R. A.: ''Design and Development of Propulsion Systems without Traction Wheels, neither Propellers, nor Jets, or Rockets''; International Conference on Mechanics and Material in Design, Albufeira, Portugal, pp. 2, June, 2017. Alcaso, A. N.; Ferreira, G. F.; Carreto, C. C.; Vieira, P. A. A.: ''Intelligent Solar Tracking''; International Congress on Energy, Environment Engineering and Management, Lisbon, Portugal, pp. 1-4, July, 2013. Caseiro, L. M. A.; Mendes, A. M. S.; Alcaso, A. N.: ''Fault Diagnosis and Tolerance in Three-Level Neutral-Point-Clamped Rectifiers''; Annual Conference of the IEEE Industrial Electronics Society, Montréal, Canada, pp. 404-409, October, 2012. Freitas, J. B.; Alcaso, A. N.; Vieira, P. A. A.: ''Design of an Intelligent Street Lighting System Based on ZigBee Technology and LED Luminaries''; International Congress on Energy, Environment Engineering and Management, Badajoz, Spain, pp. 1-5, May, 2011. Alcaso, A. N.; Saraiva, E. S.: ''Position Control of Self Controlled Synchronous Machines (Controlo de Posição de uma Máquina Síncrona Autopilotada) ''; Encontro Nacional do Colégio de Engenharia Electrotécnica da Ordem dos Engenheiros, Lisbon, Portugal, pp. 221-225, December, 1995. Dória, N., ''More Football – Electronic Access Management'', Supervisor: Alcaso, A. N., Polytechnic of Guarda, Portugal, 2016. Saraiva, L. M. G., ''Simonic - System for Monitoring and Control of a PVT'', Supervisor: Alcaso, A. N., Polytechnic of Guarda, Portugal, 2016. Alcaso, A. N., ''Position Control of Self Controlled Synchronous Machines '', Universidade de Coimbra, Portugal, 1995.